The Alabama River at Gee's Bend. Cotton canvas and denim. 75" x 45"
For years now I have very much admired the work of the quilters of Gee's Bend, Alabama, a place only a couple hours' drive from my home in Columbus, Georgia. I've never visited Gee's Bend, though, so in anticipation of a planned trip I started looking at maps. 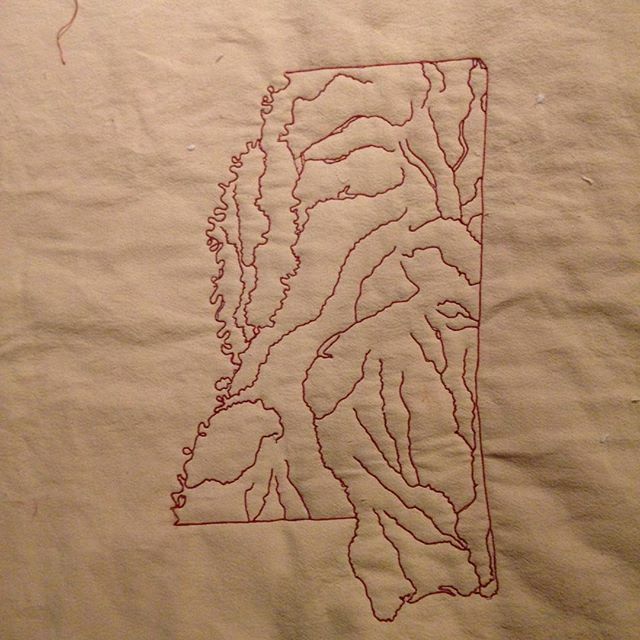 Immediately I was struck by the shape of the Alabama River -- the curves, the path, the course of the river. And I wanted to quilt it. This was my first serious foray into free motion quilting, and I got into trouble fast. I hadn't properly secured the three layers -- backing, batting and top -- and not long after I began the echo quilting I'd planned, everything started to shift and creep and crawl. I had to compensate by departing from the echos and quilting where I needed to quilt -- if that makes any sense. The result is what you see above -- quilting lines that wound up looking a lot like topographical lines, or, in my mind, furrows in plowed fields -- cotton fields. Singer-Moye Mounds, Stewart county, Georgia. Cotton canvas. As the caption indicates, that's a plat of the Singer-Moye Indian mound site in Stewart County, Georgia. The lines are true topographic lines. 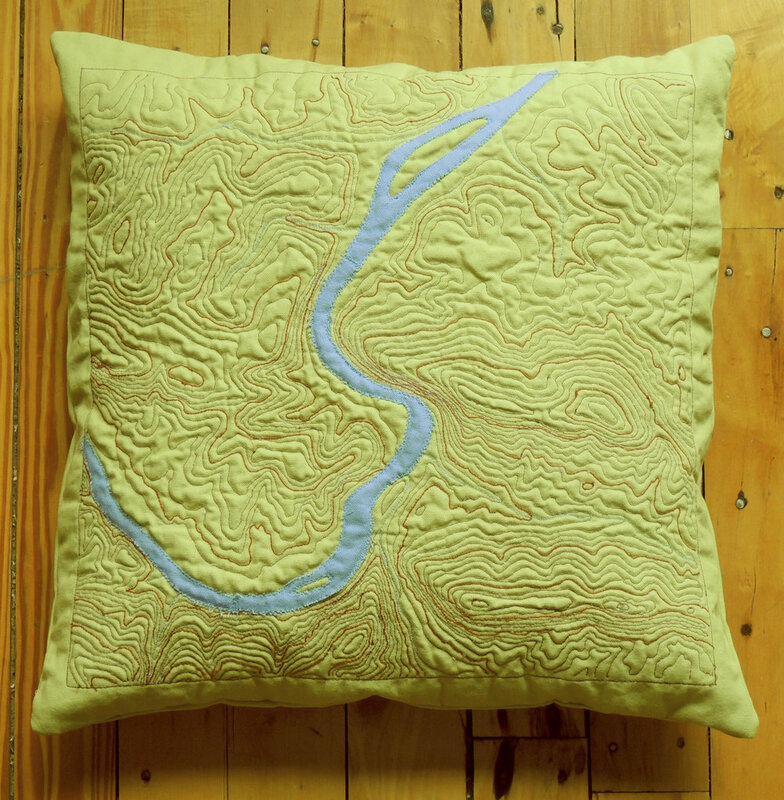 Inspired by what I thought was the success of my Alabama River quilt, I began to look for good, usable images of my own "home rivers," the Chattahoochee and the Flint, which at the Florida state line join to form the Apalachicola. I've lived all of my adult life practically on the banks of the Chattahoochee. I grew up smack dab in the middle of the Chattahoochee-Flint-Apalachicola watershed. As a kid I spent many fun weekends and vacations at the camp my extended family owned on the Flint. And after I grew up and had my own family, our vacations often took us down to Apalachicola, where the River runs into the Gulf of Mexico. All this to say, I have a long and loving history with the Chattahoochee-Flint-Apalachicola. Friends saw this and started to ask about buying it, so I wound up making quite a few and selling them. I made different versions -- some for throw pillows, some stretched for framing, some in other colors, sizes. I'm still making and selling these. Sprewell Bluff on the Flint River in central Georgia. And that's where my heart is right now. 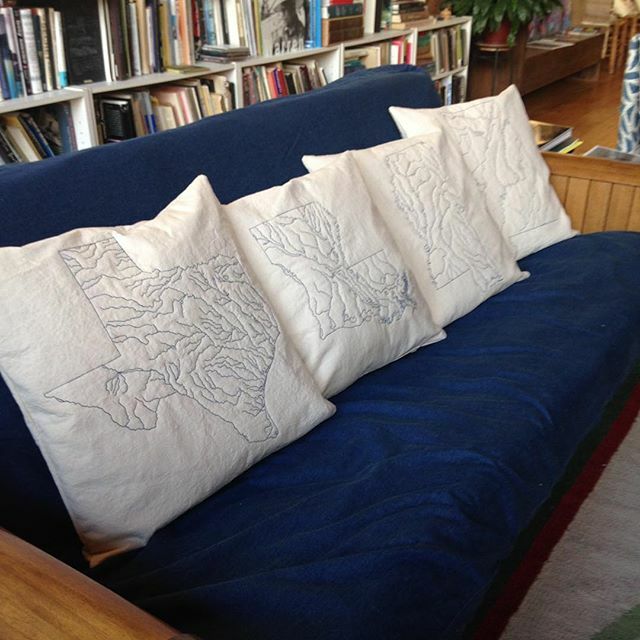 I want to make many more topo quilts. And I plan to. I'm on a temporary haitus from them because I'm away from my home studio and all my carefully accumulated supplies and equipment, but I look forward to resuming my topographical quilt series when I get home in late June.